27 years, 10 months, 27 days old age. 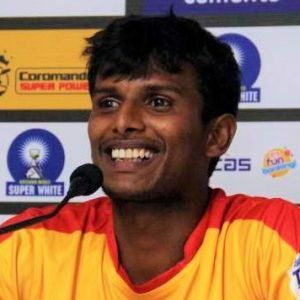 Thangarasu Natarajan will turn 28 on 27 May, 2019. Only 1 months, 3 days, 20 hours, 30 minutes has left for his next birthday. Thangarasu Natarajan has celebrated the total number of 27 birthdays till date. See the analysis by days count and bar graph. Thangarasu Natarajan was born on 27-05-1991 in Salem in the state of Tamil Nadu, India. He is an Indian Cricket Player. His father is a daily wage labourer at a saree factory, while his mother runs a wayside tea-stall in Chinnappampatti, a village 40 kilometres from Salem. Till he was 20, Natarajan played only with tennis ball, did not represent either school or college in the game, and had not even seen a proper cricket ground. It was only when he was goaded by a well-wisher from village, A. Jayapraksh, that Natarajan journeyed to Chennai and first played in the TNCA fourth division league representing BSNL in 2010-11. He caught attention with his telling yorkers. Natarajan quickly climbed the rungs. He played for Vijay in 2012-13 in the first division before moving to Jolly Rovers a year later. The dream kept getting bigger for Natarajan. He made his Ranji debut against Bengal at the Eden Gardens in 2015. After a splendid outing in the Tamil Nadu Premiere League in 2016, he was bought by the Kings XI Punjab in the 2017 IPL player auctions at a whopping INR 3 crores.